Every year during the Inman Park Festival I pin one or two visitors to the neighborhood stumbling upon a monument and discovering that the very spot where they are buying their funnel cake was once a battleground. I have the opposite affliction. I am the guy who will drive blindly down a dirt road in pursuit of a historic marker dotting a state map. Before reconnecting with my college buddy Crain Swain on Facebook, I did not realize that there was a name for my obsession - Marker Hunter. Craig and his compatriots at the Historic Marker Database have amassed an amazing Wikipedia-style catalog of thousands of historic markers, plaques and memorials all around the world. This is a must visit site for history geeks, travelers, and family truckster adventurers of all stripes. 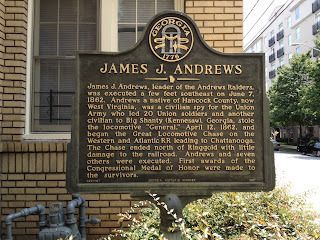 HMdb uses Google Maps for directions and search results, making it a snap to find monuments like the James J. Andrews marker tucked away in an obscure block of Midtown Atlanta. Andrews (the Jimmy Doolittle of the Civil War) was executed near 3rd Street 150 years ago for his exploits in the The Great Locomotive Chase. Atlanta is chock full of markers, but the HMdb site is foremost a key to finding hidden treasures in lost or forgotten places. The hunt is what brings history to life!